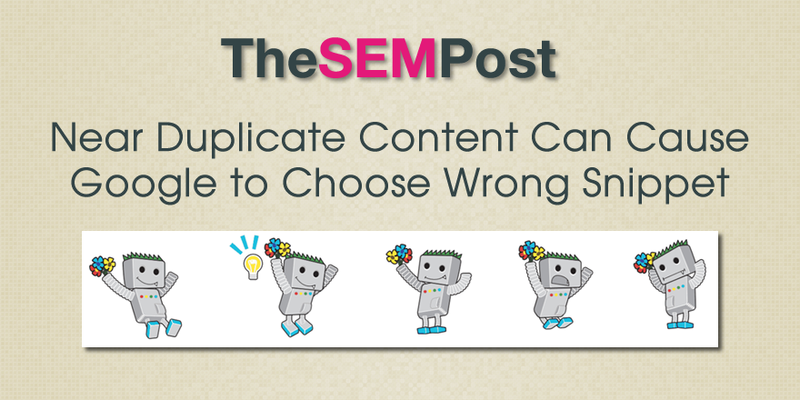 There is yet another reason why site owners should take care about internal duplicate content on their site – according to John Mueller, near duplicate content can result in Google using the snippet for a similar page in the search results, rather than the snippet for the actual page being served in the search results. Yesterday, John Mueller in a session at International Search Summit on hreflang commented that near duplicate URLs can cause the snippet from one page to be used for a different URL instead. I asked Dawn Anderson to clarify if this was an hreflang specific issue that webmasters come across while doing internationalization of a site, or if it was broader and could impact any sites. Mueller clarified through Anderson that it is all content, not just hreflang specific. But due to the similar content sometimes produced when using hreflang, webmasters might see it more on these types of sites. So if you have near duplicate content for any of your very important pages, it might be worth looking at the snippets to see if Google is pulling the correct one, and if not, work on making those pages less similar so that Google understands they are two unique pages.